Labyrinths, dark corridors and winding stairs. Pathways and prisons. The pursuit of occult knowledge and — more often than not — the ensuing madness. These are elements of the Gothic. The term Gothic first appeared during the latter part of the Renaissance. An architectural style, its characteristics included the pointed arch, the ribbed vault and the flying buttress. Evident in the edifices — cathedrals and abbeys — of the Roman Catholic and later, Protestant churches, it was also the style of many a medieval castle. 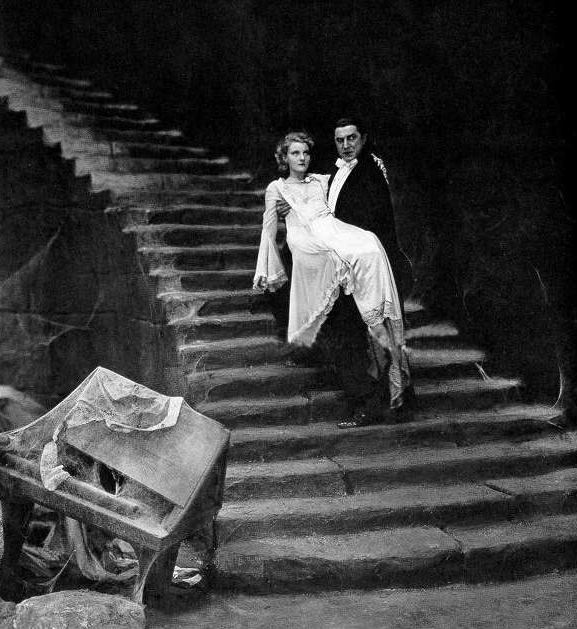 Therein lies the use of the term centuries later to refer to a literary movement of mystery and the grotesque — for many a Gothic tale finds its setting in an old castle, replete with a great staircase upon which blood is spilled, ghosts appear and heroines ascend into the unknown. Of the many influences upon the progenitors of Gothic fiction —the German and British Romantics of the eighteenth century — was the work of Giovanni Battista Piranesi, an artist known for etchings of Rome and labyrinthine “prisons” (Carceri d’Invenzione). 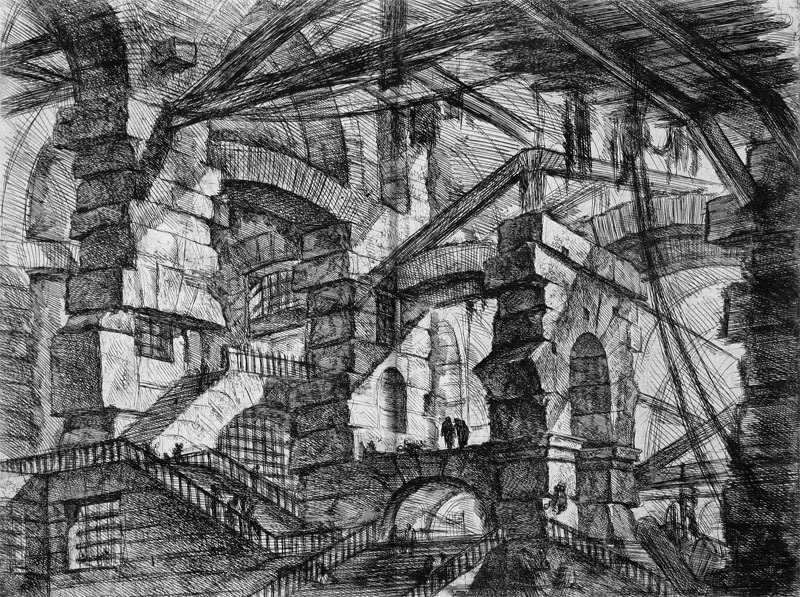 With arches, vaults and staircases that lead nowhere, Piranesi’s prisons were visions of the impossible. To the Romantics, he was a virtuoso of the imagination. The first edition of Carceri d’Invenzione was published in 1750; a decade later, Piranesi would return to his imaginary prisons, revising the existing and adding two more (click here to see all 14 of the original Carceri in order (http://www NULL.let NULL.leidenuniv NULL.nl/Dutch/Renaissance/Facsimiles/PiranesiCarceri1750/)). By the late eighteenth century, his work was known throughout Europe. Again and again, De Quincey comes back to the image of the staircase to the point where Piranesi’s labors are likened to unfinished stairs. 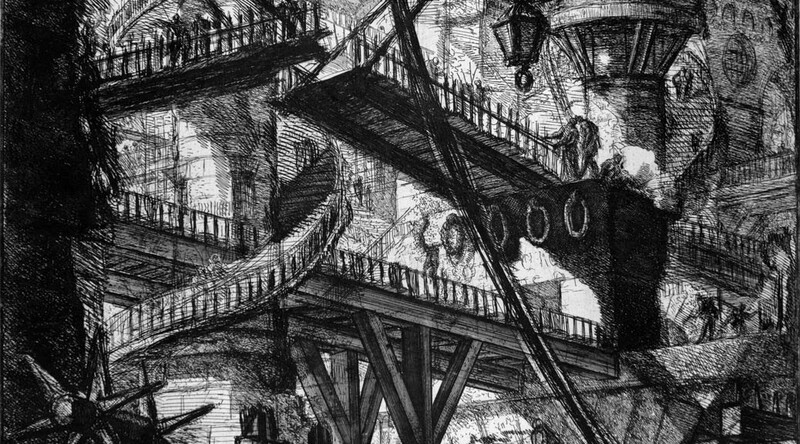 It is as if in the staircase itself, De Quincey and by extension, Coleridge (if the recollection is accurate) find in Piranesi’s etchings a potent symbol for the imagination itself. And for the authors of the Gothic novel, that symbol, consciously or not, plays out again and again. windows as the lovely Ghost past by them.” The aforementioned Castle of Otranto (http://www NULL.gutenberg NULL.org/files/696/696-h/696-h NULL.htm) finds many a dastardly deed tied to the castle’s stairs. And as late into the nineteenth century in Bram Stoker’s Dracula (http://www NULL.gutenberg NULL.org/files/345/345-h/345-h NULL.htm) (1897), the titular Count leads an unsuspecting Jonathan Harker “up a great and winding stair.” So prevalent is the image from Dracula that it is repeated again and again in film adaptations of the novel, from Carl Laemmle’s 1931 version with Bela Lugosi to Francis Ford Coppola’s with Gary Oldman (in 1992). “Winding” “dizzying” “narrow” and “great” are just a few of the adjectives tied to the Gothic staircase. More than a means of moving from point A to point B, they are a mystery within the mysterious. They are architectural ruminations of at once possibilities and simultaneously dead ends. To the writer, they are ready made for metaphor. No surprise then, Freud states that “staircases, ladders, and flights of stairs, or climbing on these, either upwards or downwards, are symbolic representations of the sexual act.” (Dream Psychology: Psychoanalysis for Beginners (http://www NULL.bartleby NULL.com/288/5 NULL.html). 1921. Chapter 5). But Freud stops short of fully exploring the nature of the staircase as metaphor in the same way that the Judeo-Christian tradition mistakes original sin as some type of sexual awakening — when it is indeed all knowledge that the forbidden fruit affords. Knowledge then, as it emerges from the path of imagination, is at the end of the staircase. Something Jung might see as Hermetic knowledge and light from darkness. Sometimes it is knowledge of a truth one does not want to confront as in the curious case of the Sarah Winchester’s “Mystery” House (http://www NULL.winchestermysteryhouse NULL.com/) in San Jose, California. Plagued by thoughts of the horrors her husband’s rifle had wrought, the widow Winchester spent the years following her husband’s death building a mansion with doors, windows and stairs to nowhere as a means, or so she thought, to confuse potentially vengeful spirits or hold off death itself. Hundreds of rooms with no sense or reason. An attempt to ease a guilty conscience. 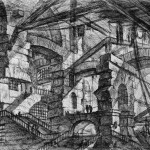 Piranesi’s etchings were born out of an Age of Reason. Knowledge, the promise of the Enlightenment, was believed within reach by men of science in the mid seventeenth century — providing the man of reason stayed the course and used a scientific mind to stay on point. But as Piranesi’s mind-boggling prisons reveal, the imagination — the creative yet too often cruel tool of the inquisitive mind that was championed as much as reason by poets and philosophers of the early nineteenth century — can obfuscate more than enlighten. Or perhaps better put: enlighten through the challenge of obfuscation. 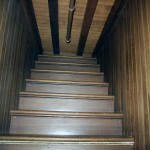 Stripped of its many layers of metaphor, it becomes clear that the staircase is the mind. Up into the light. Down into the dark. Knowledge. Fear of the unknown. It has been reported that among the many influences for J.K. Rowling’s depiction of the Grand-Staircase (http://harrypotter NULL.wikia NULL.com/wiki/Grand_Staircase) at Hogwart’s was a bookshop in Portugal called Livraria Lello (http://portugalconfidential NULL.com/2010/08/livraria-lello-a-bookstore-beyond-beautiful-in-porto/). In its beauty and grandeur, one can see a model for Hogwart’s in Livraria Lello, but it is not until one really considers the bewildering movement and plot points served by Piranesi-like staircase at Hogwart’s that the real foundation for Rowling lay somewhere in the Gothic. 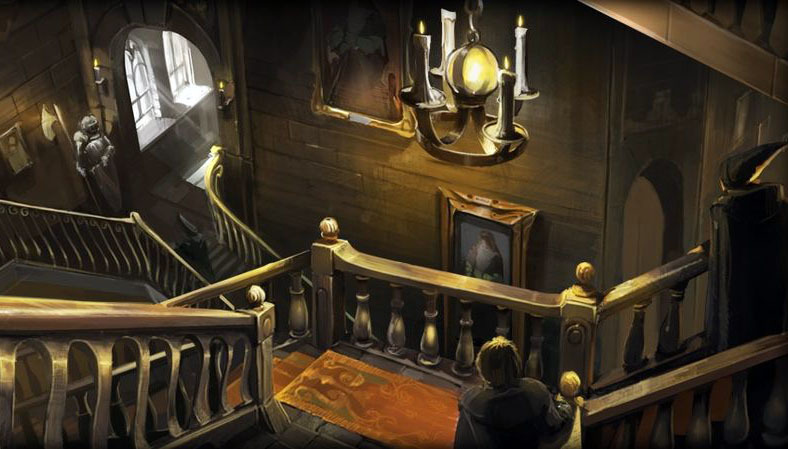 Not only is there an impressive architectural style in Hogwart’s, but also, even more so, a movement of the mind therein — from darkness to light. 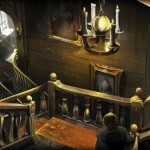 It is this very movement that for Harry Potter and company literally reveals hidden [i.e., occult] knowledge again and again across the novels each time the Grand Staircase comes into play, placing Rowling’s work (and the eerily reminiscent prisons of Piranesi) firmly within the Gothic tradition.